As you may recall, I took it upon myself to clean out and paint the closet on the third floor of our house. The mid-project update can be found here. On a scale of easy-medium-hard, this project was medium. It would definitely have been easy if it weren't for the floor design and broken window! Here are some before images of the closet after everything was removed. Also hiding behind some insulation was a broken window that we had repaired. Since we have so much leftover paint from other rooms and projects, I decided to go paint shopping in the basement. Actually, Kevin asked me nicely if I would consider using up other paint so I thought I'd give it a try. Here is the line-up of colors that was entirely free as I got it from the basement store! First I primed the floor and walls. The floor took 3 coats and the walls took 2. Since this closet is not full height and I am, this resulted in several bangs of the melon and much leg cramping. Then I painted the walls Buttermilk (2 more coats) and the floor Haystack (2 coats). The window trim was last and also took 2 coats. By this time, I was about ready to throw in the towel and forget the floor design, but since I came this far, I decided to keep on keepin' on. I also mentioned in the previous post that I would be adding a design to the floor. For this, I needed some inspiration. Earlier this summer, Kevin and I attended the Lotto family reunion, also known as Lottofest. Lottofest came complete with a custom flag, a program of entertainment, good food and a dance party! Those Lottos sure know how to have a good time. Anyhow, I digress. 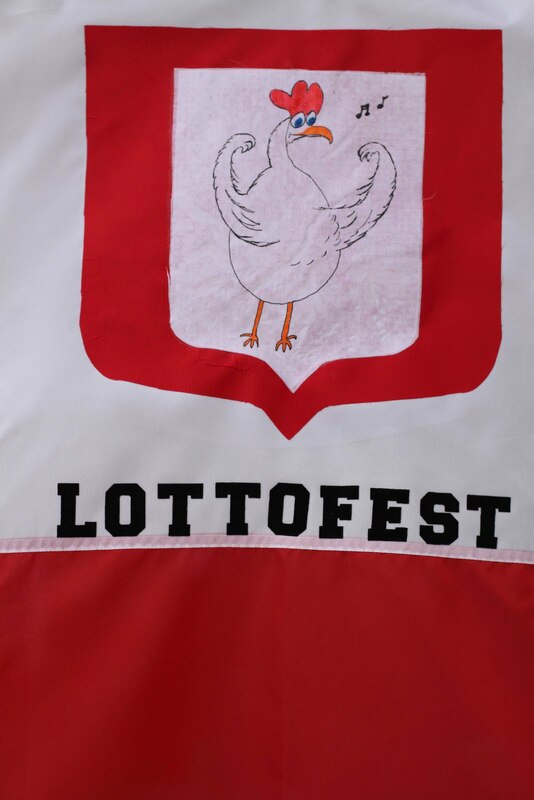 Here is the Lottofest flag that have me the idea to design my own L insignia. Since I wasn't about to paint a chicken on the floor, I needed to put my own stamp on the design. Here is the stamp and sketch that I went off of. The stamp is from Paper-source and the sketch is from my big book of fabulous ideas. Then, I set out to find an L monogram that I liked. I also found this at Paper-source although Anthropologie had several options as well. Once I had all of this down, I decided to make the outer diameter of the design 36". To establish the circles, I placed a screw in the center of the circle and used a pencil and string to draw it out. 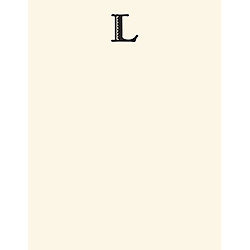 I sketched out the L by measuring the monogram and multiplying the dimensions by 30. This gave me the rough dimensions and I sketched out the rest by hand. I painted the background Mayo, let it dry, then painted the inner circles and the L Monticello Peach. Any wah-lah the finished product! I also think this would be a cute idea in a kid's room or above a headboard in the master bedroom. I haven't even gotten to the real reason for the project and that was to organize the closet! Stay tuned. This is soooo cool! I want to do this someday!